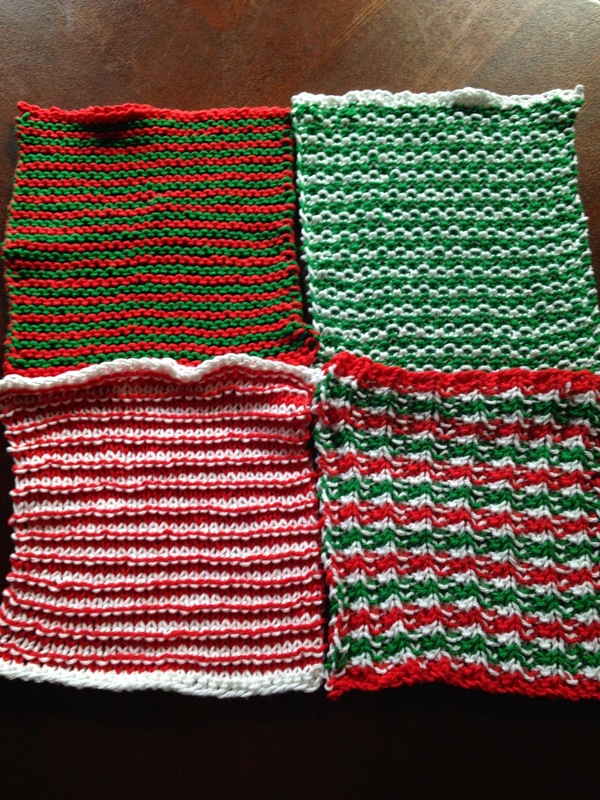 Last night I finished my final gift: a set of Christmas-themed dish cloths for my sister-in-law's parents, who are putting me up for a few days next week. I've brought them different host gifts in the past, but the mother really likes these cloths and specifically requested more. They're made with Peaches and Creme worsted weight cotton. I have a ton of this stuff in my stash. They have a huge variety of lovely colors, and it's super sturdy and machine washable. So that's it, I am done for Christmas 2014! While I'm on vacation next week, I plan to finish some socks for myself that I started ages ago but put aside for gifts, and I want to make another cowl scarf for myself. You can't have too many of them (OK, maybe you can, but I don't care because I like them so much).